There was light. For the first time: an incense of life, perfumed by burnt explosion and the airy pieces of purity: the redolence of God. Our nose can remember 50,000 different scents. Perhaps it begins with the distinct odor of my mother's womb. But babies start dreaming even before they're born. And my tiny nostrils only remembered the stars' scent: gaseous, minty, metallic, lemony, mildewed and the rest were sulfur-like aroma. When I was born, my mother smelled me for the first time: she was visiting almost all the galaxies. I grew up with the sharp whiff of gun powders and bombs as my great grandmother didn't forget her evening stories. A woody night with the bamboo bed, moldy mosquito net, and the comforting fear of her favorite line: "But if war didn't come, your grandpa and I would not meet." She loves the flowery fragrant of the summer wind, it reminds her of him. They met one summer during World War II. She taught me to pray: to remember. Scents are memories. Like a fisherman's wife who chants with the saltiness of the air just to be part of the sea, to transform to saltwater for her husband's safe return. My grandfather was a mango farmer in the morning and a garbage collector in the evening. My father said: "When he arrives, we can sniff solidify sweats from his body. But we are glad; it means he works hard for us." When I was five, everything smelled like the city or sadness. My younger brother died. There was an earthy hint of thick soil whenever I washed my hands. It stained in my palms. At night, I hid in the dark so that it would not discolor anything. A woman says: the window is a transition. The moment she moves the curtains in the bathroom, she remembers how to rearrange her sight when she rubs her eyes. Her skin is solitary with all those abdominal lines and stretch marks from her seven children. It is filled with cycle, a moon like effect: a different face every night. Her skin has names of the streets that she often memorizes like a prayer. They have their own smell that magnets tranquility and touching. While cleaning the tiles, she stops. "Scars are the best cleanser," she says. They have their own presence that spills like water all over to wash away the debris. It runs. It runs. The woman begins to put together the curtains as she closes the window shield: she forgets somewhere in one of those street names. It was just a year ago when I saw someone died in front of me. I was clothed by monsters of dust. Now, whenever I visit an old house or an antique shop, my bones age. An awakening: death has a smell of the beginning. Cindy Velasquez is a Cebuano poet and lyricist. She volunteered to teach poetry for "The Kids at the Museum" which was sponsored by Ramon Aboitiz Foundation Inc. and the City of Cebu. She collaborated with Jude Gitamondoc and Mark Angeles. She is also a member of Bathalan-ong Halad sa Dagang and Women in Literary Arts. She won the Jimmy Y. Balacuit Literary Award 1st Prize for poetry during the 16th National Iligan Writers Workshop. And in her free time, she climbs mountains. Currently, she teaches Humanities & Literature at the University of San Carlos. 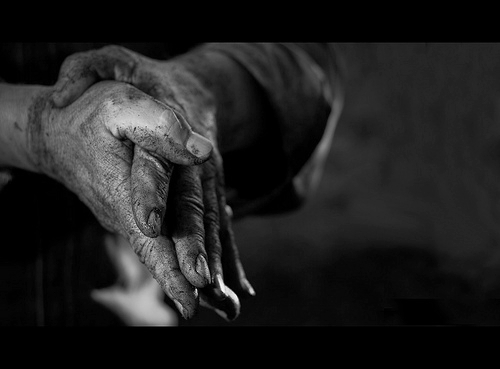 Photography: adapted from working hands, by Francesco Rachello.